Reviews are a bit of work to come by, but they are an important part of promoting your books. 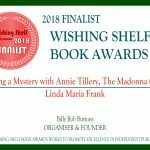 Here is my review as a result of contacting Wishing Shelf Book Awards. and happily throws all manner of twists into the mix. providing the readers with plenty of chemistry between the two central characters. sort of characters a reader can root for, can cheer on till the very end.